Who's the Better Back: McCoy or Westbrook? 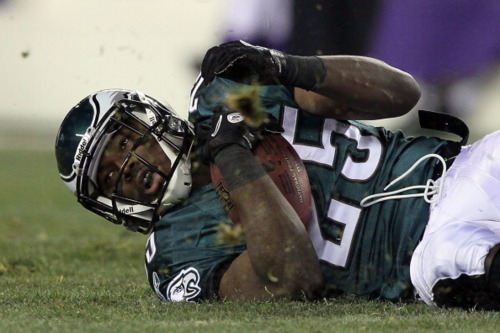 Recently, free agent and former Eagle Brian Westbrook said that he would like to return to Philadelphia. While such a move might make sense if Andy Reid wanted a veteran back-up, the truth is that Westbrook is a forgotten man in Philadelphia, where LeSean McCoy’s stellar 2010 campaign wiped away any doubts that he could fill his mentor’s big shoes. When the Eagles let Westbrook walk last offseason, many people wondered if McCoy was ready for the starting job. His rookie season showed promise, but McCoy was still raw. He danced too much before hitting the hole, hadn’t mastered blocking assignments, and couldn’t be counted on in the passing game. But after changing his uniform number and physique in the offseason, McCoy was stellar in 2010. In fact, McCoy was one of the most consistent offensive leaders, racking up big numbers despite injuries at quarterback and holes along the offensive line. I broke down the numbers by rushing and receiving, so let’s examine them in that order. Westbrook and McCoy had a shockingly similar number of carries in the same 16 games, including playoffs. Yet see who was the more efficient runner? Looks like Shady has a leg up on his predecessor at this point in his career. McCoy averaged half a yard more per carry and scored four more touchdowns. He also scored big DVOA points compared to Westbrook and had a higher Success Rate, another Football Outsiders stat that measures consistency. McCoy did benefit from a slightly better run-blocking offensive line, according to FO’s Adjusted Line Yards, but the difference was marginal at best. McCoy, in his first season as the feature back, was clearly the better runner. Then, when you look at the receiving numbers, the paradigm shifts. Westbrook had a significantly higher Yards per Reception figure and scored eight huge touchdowns. Plus, while McCoy’s DVOA is solid, Westbrook’s is incredible. Number 36 was simply a better receiving threat. What does this mean? Putting it simply: McCoy is a better rusher, but a worse receiver than Westbrook was at the same time in his career. That redistribution of talent fits perfectly with the rest of the Eagles current roster, which is already bursting at the seams with explosive outside threats. There’s less of a need to design pass plays for the running back when DeSean Jackson and Jeremy Maclin are on the outside (not that Terrell Owens was a slacker). Even with these differences, it’s fascinating to watch McCoy follow in Westbrook’s footsteps, performing the same dual-threat running back role. Already, McCoy lived up to Westbrook’s example and has surpassed the 31 year-old in some areas. Only thing to see now is if McCoy can sustain it into the future. Tagged with Philadelphia Eagles, Running Back, LeSean McCoy, Brian Westbrook, Rushing, Receiving, Offense, Offensive Line, Consistency, Football Outsiders, DVOA, Success Rate, Adjusted Line Yards. March 21, 2011 by Brian Solomon.